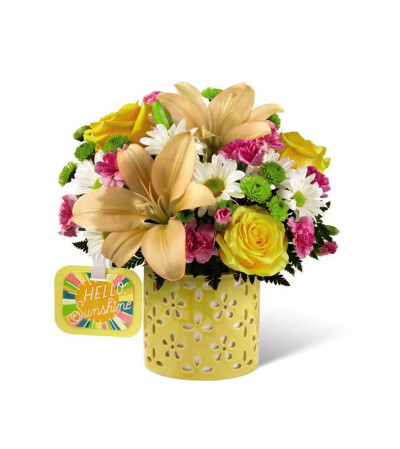 Send a warm ray of sunshine and your happiest thoughts straight to their door with The FTD¨ Brighter Than Brightª Bouquet by Hallmark! Bringing together an inspiring collection of blooms, including yellow roses, peach Asiatic Lilies, yellow carnations, white daisies, green button poms, and hot pink mini carnations, this gorgeous flower arrangement is styled in a keepsake yellow ceramic vase, fashioned with a sweet cut-out design, and arrives with a Hallmark tag that reads, "Hello Sunshine." 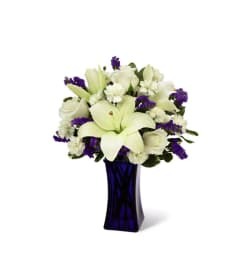 An unforgettable way to send your thinking of you, thank you, or get well wishes! 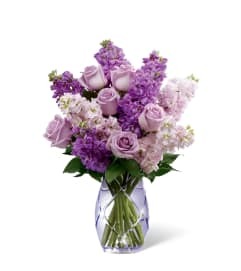 GOOD bouquet includes 9 stems.